ABS-CBN’s digital terrestrial channel YeY has announced on Saturday that My Hero Academia will start airing on the channel in Filipino dubbing this month. The teaser mentioned that the popular sci-fi anime will premiere on Monday, May 7, which means that it will air Every Monday to Fridays, but no mention of its time slot. Anime Pilipinas reported last November that the dubbing sessions for the anime’s first season had concluded the same month, according to an Instagram post by Daisy May Cariño, who served as its dubbing director. 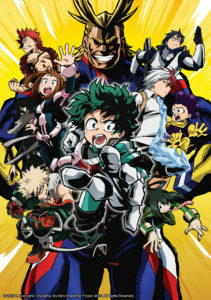 The social media post also included a video clip, which shows Mark Ivan Uy voicing the lead character “Izuku Midoriya” and Elle Genovata as “Tsuyu Asui”. My Hero Academia is an anime adaptation of a Japanese manga series by Kohei Horikoshi, which is being serialized on Shueisha’s Weekly Shonen Jump magazine since July 2014. The manga series currently has 18 volumes. Southeast Asian anime channel ANIMAX Asia aired both first and second season of the anime on a simulcast basis. There is still no word when will the anime channel air the anime’s third season. YeY is one of the digital terrestrial sub-channels of ABS-CBN, and the second animation channel of the network after the now-defunct anime channel HEROtv. Previous anime titles also aired on the digital TV channel include Kirarin Revolution, Rental Magica, Tears to Tiara, and Ace of Diamond. YeY can be seen on digital terrestrial TV exclusively on ABS-CBN TVplus set-top boxes, as well as SKYcable Channel 01 (Metro Manila, CAMANAVA / Rizal, Cavite, and Laguna) and SKYdirect Channel 03.